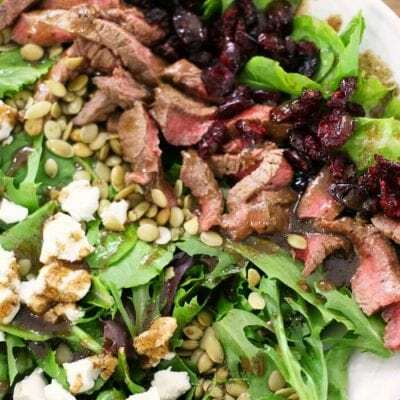 Cranberry Goat Cheese Steak Salad is the perfect easy and delicious protein packed salad for your next lunch or dinner! This Steak Salad brings me back to the days when I worked a 60+ hour week and wore uncomfortable suits with ridiculously high heels to work. Once upon a time when lawyering was my thing, there was a grossly overpriced restaurant around the corner from our firm and they had a cranberry and goat cheese steak salad that I was absolutely obsessed with. Obbbbbsessed. It was so overpriced that even when money wasn’t an issue (can you believe there was a time like that?!) – I still couldn’t bring myself to go there more than once a month. A girlfriend of mine recently asked about what to do with some leftover goat cheese and it reminded my of this beloved salad. My law career, and that restaurant, are long since retired, but memories are still fresh. And delicious. What type of steak in steak salad? Any type of steak is fine! 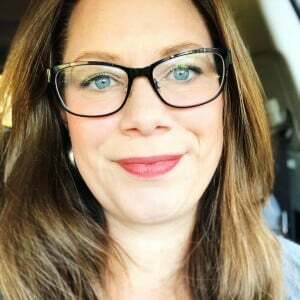 I usually gravitate toward the less expensive cuts like top or bottom round, because it’s going to be cut thinly, so you won’t have to worry about it being a little tough. Also, it’s leaner. The fattiness of other cuts is great when you need that flavor to stand alone, but in a salad you have lots of flavors coming together so the fat isn’t necessary. Flank steak and skirt steak also work well! 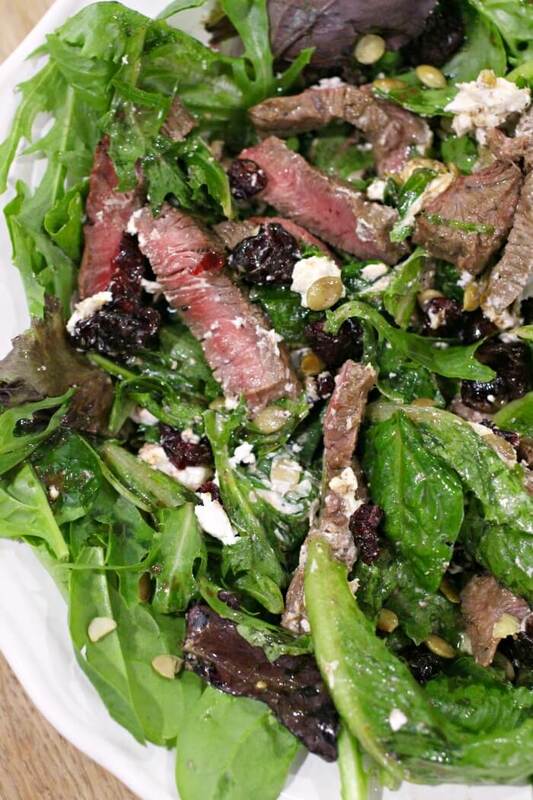 We have a fabulous flank steak marinade that would be perfect with this salad. How do you cook steak for a steak salad? Any way you like, really! Sometimes on Sundays we’ll do a big meal prep on the grill and have steak to use for all different meals throughout the week. Other times I throw it under the broiler for a few minutes. Broiled flank steak is great! You can even do a restaurant style steaks if you’re feeling fancy! Probably not necessary for a simple steak salad, but hey – maybe you’re trying to impress someone? What to put in steak salad? 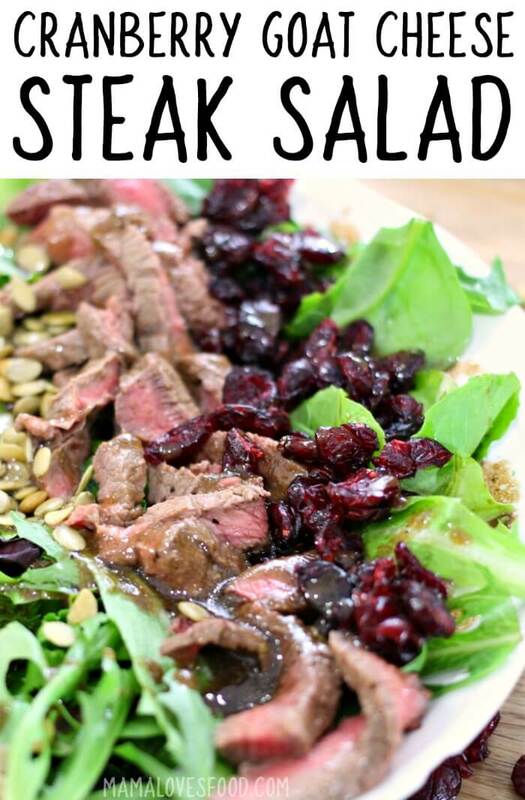 Steak salads are so versatile – this is goat cheese and cranberry version is my personal favorite. 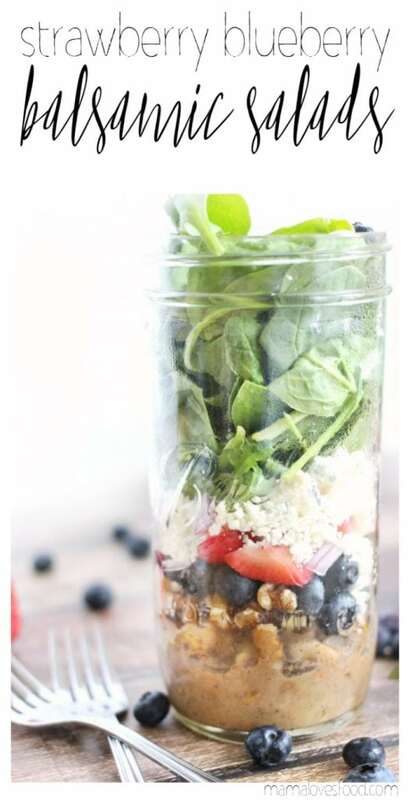 We also make this yummy balsamic salad dressing to go with it. As for the pumpkin seeds, you can use those, or pine nuts, or sunflower seeds! Make sure to peek out all our salad making favorites with these Amazon affiliate links! 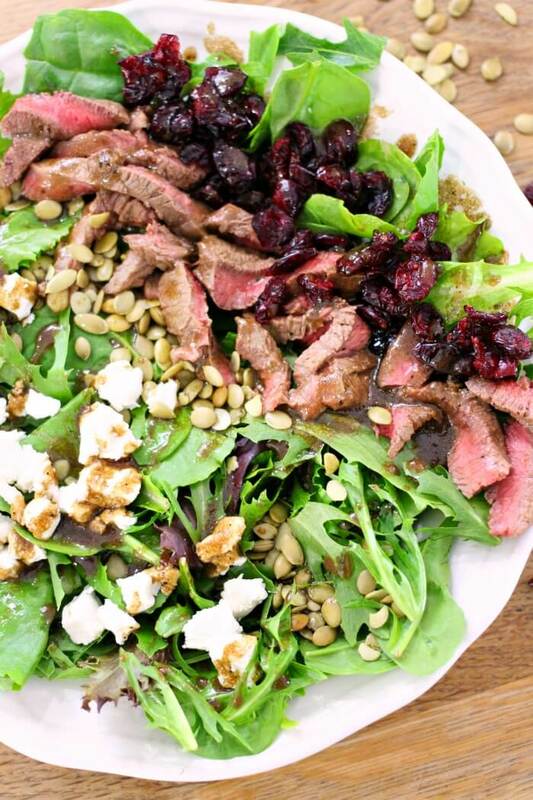 If this Steak Salad makes you happy, then you’re sure to love these other salad recipe ideas! Fig and Blue Cheese Spinach Salad – So much flavor! Sweet figs, salty blue cheese, and tangy vinaigrette, this Fig and Blue Cheese Spinach Salad will make you fall in love with lunch all over again. Bacon Maple Dijon Dressing – Yes, you read that right. 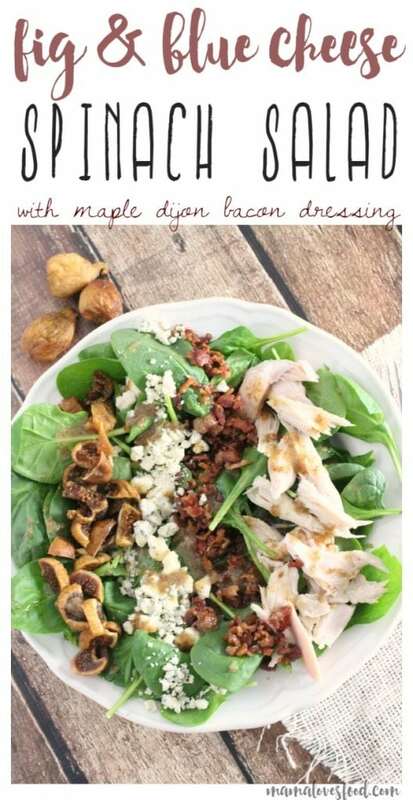 Bacon Maple Dijon dressing is as good as it sounds. Mmmmm. Don’t be scared away by the ingredients, I promise it’s not too heavy – you’re going to love it! Spinach and Pear Salad – What?! Spinach and pears? It works, and it works well! I like to serve this with a heavier side, like our cheesy broccoli potato casserole. The Ultimate Loaded Burger Salad – Okay, we’re not really going healthy with this one, but we are going deeeeelicious. Definitely don’t skip the dill relish, that’s my favorite part! You can use sweet relish if you like, but I’m not sure we can be friends. Easy Antipasto Salad – It’s like all the yummy stuff from an afternoon at my Italian grandma’s in a salad, yassss! Nostalgia and a full tummy. Sounds like a date to me. Weeknight Taco Salad – Skip the shells, and dump all the goodies into a giant bowl with lots of lettuce. Then, crumble a shell on top. Ridiculously easy. I like to have the taco meat made ahead in the freezer so all I have to do is microwave it when we’re ready to eat. Easy peasy! Balsamic Avocado and Blue Cheese Salad – Add chicken to this Balsamic Avocado and Blue Cheese Salad and you have a full (and oh em gee, so delicious) meal! It’s loaded with good healthy fats and will keep you full all afternoon. 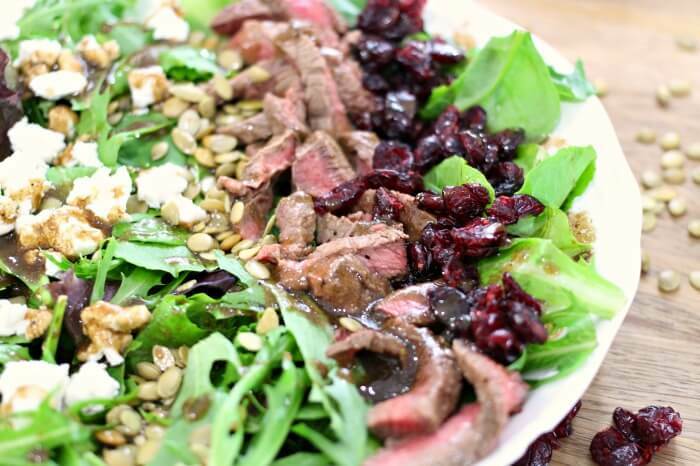 You can also watch us make this Steak Salad on Youtube! Make sure to tune in for all our live cooking shows! 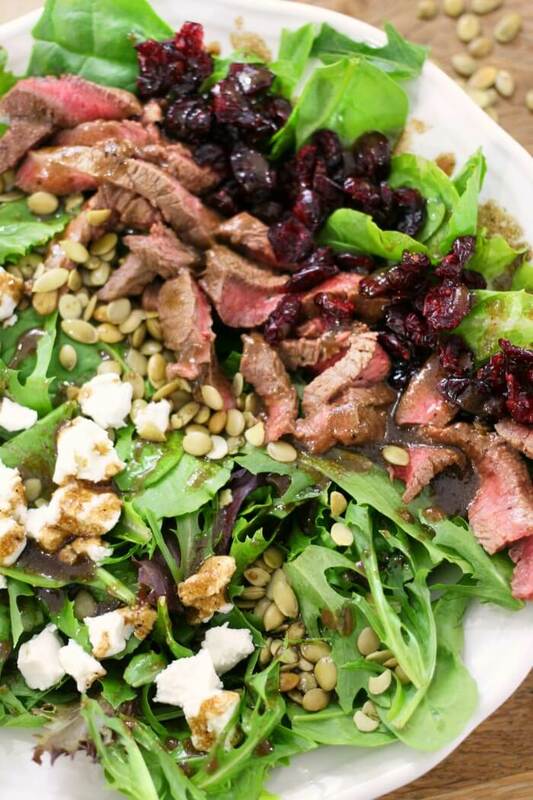 Cranberry and Goat Cheese Steak Salad is the perfect easy and delicious protein packed salad for your next lunch or dinner! Find a big bowl and pile the ingredients together. Use more goat cheese and cranberries than you think are neccessary. Pour a generous helping of balsamic dressing over top. I have a stash of pine nuts that I save just for the right recipe. Looks like I’m breaking them out! The balsamic dressing is perfect over steak! April! 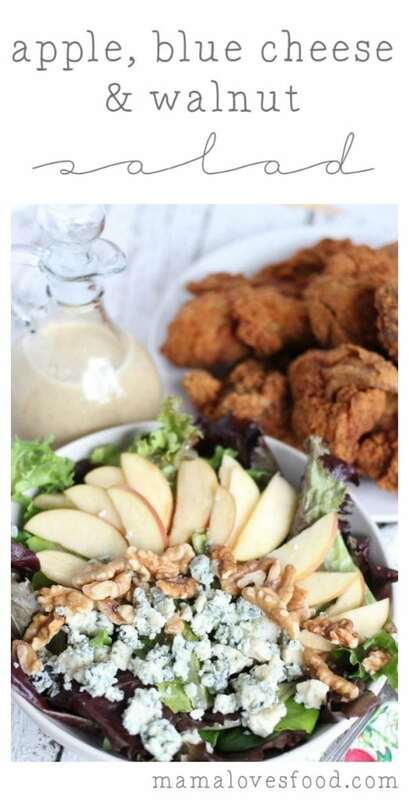 You’re speaking to my heart with this salad! I’m NOT a huge fan of salads in general – UNLESS they’re packed full of delicious protein and cheese like this one is! Love it!